JMP Australia , a leading provider of turn-key robotic palletising, packing, stretch wrapping and conveying solutions have recently released the K-Pal Palletiser. 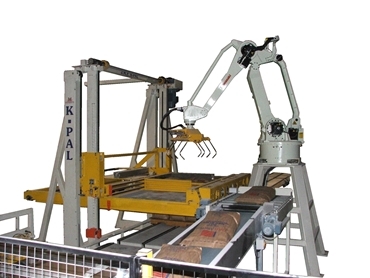 The K-Pal Palletiser is ideal for the handling of unstable, awkward or bulky packages. A feature of the K-Pal Palletiser is its industrial robot which picks items from an infeed conveyor and places them onto a layer squaring and stripping plate assembly. A whole layer is formed robotically then deposited onto the pallet stack in the same fashion as a conventional layer palletiser where the stripping plate slides back placing the product onto the pallet stack. Seeing that the layer squarers lock the packages against each other as they are placed on the pallet stack, this palletiser provides an excellent solution for irregularly shaped products that don’t easily stack on top of each other. In addition, the layer squaring arrangement helps prevent items from sliding off uneven stack formations. The result is a very square and tightly packed pallet load which is very stable. And, because the stacks are tighter and more stable, it is possible to build taller stacks.